I went into the first day of my first sales job expecting my work with potential customers to be tough, but like most sales newbies, I was ready to overcome objections. After day three, I found that my expectations didn’t line up with reality. The most overwhelming part was not interacting with customers, but using our CRM platform, Salesforce, to keep track of those interactions. I struggled to navigate Salesforce. With so many ways to customize the platform, learning to adapt to our team’s way of using it baffled me. Sandbox, Chatter, picklist? What were these foreign words? Is this an event or a task? What stage should this be? Do I need to dedup this? Also…how do I even do that? Through the end of the week, I avoided Salesforce as much as I could. I stayed “organized” enough with pen and paper. Or so I thought. The next week my manager set a goal for conversations taking place through outbound calls. “Shouldn’t be hard,” I thought. There was only one problem: We needed to track the calls in Salesforce. At that point I realized that if I wanted to show my progress, I had to log each call. Five things helped my Salesforce adoption to stick. I’ve turned them into lessons for you to consider next time you bring on a sales and/or CRM newbie. My manager put me in touch with a Salesforce rep to train on the most basic functions of the platform, so I could get comfortable with it. Then I shadowed coworkers to learn the day-to-day necessities and how to get around Salesforce without pulling my hair out. 2. Don’t focus on the technology. With new CRM users, it’s less about the technology and more about staying organized. For me, things started to get confusing when the training focused on gizmos and gadgets, rather than how I could keep things orderly. Keep this in mind whenever you teach CRM, and it’ll not only be simpler for individuals to learn, but make the value of the platform clearer – that’s when Salesforce adoption really takes off. Once my manager tracked my activity, it encouraged me to use the platform more. It also gave me direction on how to use it. With a clear sales goal in mind, I focused on logging calls instead of spending time fumbling through dashboards. 4. Hold new users accountable. When my activity became visible to others, I felt accountable. This motivated me to stay away from pen and paper and instead focus on adding all of my events to Salesforce. 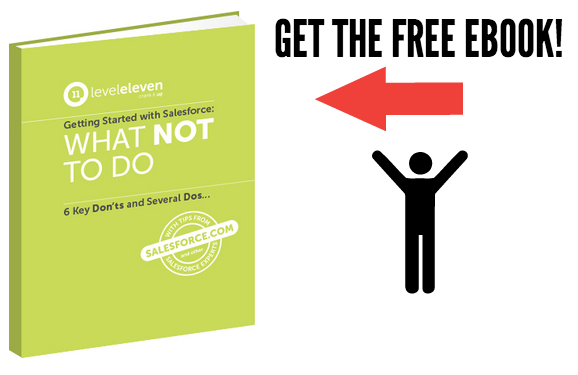 Having one simple objective made managing Salesforce much easier. I understood my manager’s expectations and focused my CRM activity around that goal. After two weeks of practicing these tips, I said so long to pen and paper and became a Salesforce pro. They all added up to get me using the platform so that I could see its value. Now, I couldn’t imagine my workday without it. So take it from me, the classic sales newbie: Leverage training, focus on value, set up visible goals and keep things simple. Then Salesforce adoption will be immediate for your new hires. These 5 things helped my Salesforce adoption stick, and they can do the same for your next sales hire.